Woo-hoo! what a day we had today in Istria! First of all the weather has been wonderful this past month. One of the best Indian summers we had in a long, long time. And since we knew that sunny days were counted (and that cold, rainy winter, like you only find in Istria, is just around the corner), we decided to get out and enjoy a full day in the nature. We've started with a visit to the Park Histria Aromatica. More about that in the next blog post. And afterwards we've visited the Stancija Meneghetti. I'd add, finally. We were due to visit this place for a long time, but somehow never made it. Villa Meneghetti is a wonderful estate located between Bale and Barbariga, and reachable only via an unpaved, dirt road. Villa Meneghetti is stancija, which means homestead here in Istria, and it's typical for the region. And Meneghetti was a family name of homestead's first owners. Thus, the name! Today, Stancija Meneghetti is a gorgeous property featuring a butique wine hotel, with only 4 rooms. It's a part of renowned Relais&Châteaux hotel brand. It also features a fine dining restaurant, wine cellar and wine tasting room, on-site vineyards and olive groves. The estate spreads on 30 acres. Villa Meneghetti is away from it all, and it's a perfect getaway for foodies, or just anybody who is looking for a piece and quite and to relax and reconnect with the nature. This hotel has only four rooms, located in an old farm house with exposed stone walls and wooden beams. Rooms are super large, some with en-suite bathroom as large as room. Three rooms are located on the first and second floor of the main building, while the fourth duplex room is located in a small detached house across the main building. Rooms feature king size bed, flat screen TV, a wine cooler, and (my favorite feature!) a fully functional wood burning fireplace. Hotel also features indoor and outdoor swimming pool, and a shared lounge room with sofa, armchairs, and large wood-burning fireplace. Prices start from 106 € per night in a standard room for two with breakfast. We spent three hours eating at this place. And from what I've heard this is consider a quick lunch here at Meneghetti. Here people often enjoy their lunch late into the night. Restaurant has just couple of tables indoor, and few more outdoor. So be sure to make a reservation. Interior is gorgeous; one room reminds of nonna's kitchen, another one of nonna's living room. Menu changes often at Meneghetti. And while staff can accommodate your needs to certain extent onsite, we highly recommend you to call in advance and inquire about the menu. Their fall menu featured four to five cold and warm starters, main courses and desserts. We tried a little bit of everything. Don't forget that this is a wine hotel that produces their own wine, so every meal is paired with Meneghetti wines. We skipped cold appetizers, and went straight to the warm ones. We ordered gnocchi with wild mushrooms: black trumpets & chanterelles, prosciutto, and a beefsteak. Gnocchi were a bit stiff for my taste, but nevertheless the dish was sublime. It was juicy and super tasty. We were drinking Meneghetti white wine Malvazija 2013 with our gnocchi. For the main course we had pork tenderloin in tempura with braised shredded green cabbage and cherry tomatoes, served with a red wine reduction. Actually, this red wine reduction is inspired by a traditional Istrian winter specialty, called Istrian soup. Although it's not really a soup. It's a mixture of grilled bread, sugar, pepper, oil and hot red wine. I've never tasted Istrian soup, but reduction of Istrian soup that accompanied my pork tenderloin was yummy! With our main course, we drank Meneghetti's most popular wine, simply called Red. Red is a bland of Merlot, Cabernet sauvignon, and Cabernet franc. For a dessert it ought to be Labinski krafi, a traditional dessert from the east coast of Istria. It's ravioli filled with cottage cheese and raisins. And here at Meneghetti ravioli were homemade, and served with a lemon cream. Krafi were absolutely delicious. Meneghetti still doesn't produce their own dessert wine, so we had Kabola's Muskat. Lovely wine! Fast forward to two days after this first visit … and we were back to Meneghetti. We had a such a great time at Meneghetti that we went for another lunch here just two days afterwards. This time we tried to taste something different. So for starter we ordered their pumpkin soup. For me nothing says autumn more than a pumpkin soup. And the one at Meneghetti was excellent. Actually it was the best pumpkin soup I've ever tasted. It wasn't as sweet as pumpkin soups usually are, and the whole taste was just better balanced than any other soup of this kind I've tried before. For the main course we chose a tuna steak. I am always scared when ordering tuna in the restaurant. And the fancier the restaurant is, the more scared I get. You probably wonder why. Well, I hate my tuna rare, or medium rare, or even a medium. I'll say it loud, I love my grilled tuna to be well done! Here you've got it. And do you know that cooks hate when somebody orders a well done tuna? They hate it to the point that they are ready to refuse to make it that way. Anyways, I got my tuna the way I like it. And it was great. For a dessert we also decided to try something different. And our waiter suggested that we should go with their surprise dessert. I normally don't like surprises when it comes to food, but I guess my experience so far at the villa Meneghetti made me rust this guy. And am I happy I did so. A dessert came in a high glass, and it consisted of four layers: a layer of sea salt, a layer of Meneghetti extra virgin olive oil, a layer of bourbon ice cream, and on the top a layer of chocolate. A true explosion of tastes. A must-try if you visit the restaurant at villa Meneghetti! Meneghetti Winery, located onsite, produces five different types of wine, and four different single-sort olive oils. They also teamed up with Kuća Glavić, a wine producer from Konavle region near Dubrovnik, to offer new types of wine to their customers. Meneghetti wines are divided in four lines based on their distinctive character. An Art in the Bottle line features their signature wines: Meneghetti White, and Meneghetti Red. Meneghetti White is aged, bright golden white wine, a blend of Chardonnay and Pinot Blanc. Meneghetti Red is a blend of Merlot, Cabernet Sauvignon, and Cabernet Franc. This is perhaps their most popular wine. It's well-balanced, full-bodied wine of a deep ruby color. We've tasted it during our lunch and loved it. A Soul of Istria line features Malvazija, Chardonnay, and Merlot wines. We only tasted their Malvazija 2013: fruity fresh white wine of a light yellow color. Although it's mostly made of Malvazija Istarska grapes, the wine itself is blended also with small quantities of Chardonnay and Pinot Blanc. A Taste of Joy line features Meneghetti Classic, a sparkling wine made using the classic Champagne method. A Kuća Glavić line features three wines: Kuća Glavić Rosé, Kuća Glavić Malvasija Dubrovacka and Kuća Glavić Syrah. Kuća Glavić vineyards are located in the southern Croatia, in Konavle region, near Dubrovnik. Wines are aged in Meneghetti cellar in Bale. We only tasted Malvasija Dubrovacka 2013, and liked it. Although, to our taste, Karaman Malvasija Dubrovacka is hard to beat. And now, a word of two about Meneghetti olive oils. Meneghetti produces four single-sort extra virgin olive oils: Leccino, Bjelica, Rosulja, and Buža (or Izbor as they call it). Leccino is made of Italian sort of olives – leccino, one of the world's most spread cultivar. The oil is mildly bitter and piquant, and it has a dark green color (color actually doesn't matter in the sense of quality of oil, but nevertheless, I love when olive oils are of this wonderful dark green color). Meneghetti's extra virgin olive oil Bjelica is made from an indigenous olive varietal – Bjelica, grown in Croatian regions of Istria and Kvarner. This olive oil is golden green in color and has a specific piquancy and bitterness. Meneghetti's Izbor is made of Buza varietal, the most grown olive varietal in Istria. This is actually our favorite of all Meneghetti's olive oils. It has a very intense fruity taste, and it pairs well with all food. We haven't tasted Rosulja yet. It should hit the market for the first time in 2015. Rosulja is also an old, indigenous olive varietal typical for Vodnjan and Rovinj area. 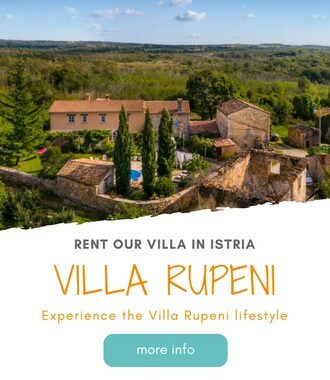 Further reading: If you are interested in wine tasting in Istria, we've put together a post on must-visit wineries in Istria. We also wrote about olive oil tasting at Belic in Rabac, and Agrolaguna in Porec. We've also wrote a list of the best restaurants in Istria. Have you visited Villa Meneghetti? If yes, what did you like the most about it? If you haven't stayed there yet, would you like to stay at such a place? Let us know in the comments below. Wow, this place sounds fantastic! It’s going on my list of places to check out. Yes, after our non-summer, we had a beautiful Indian summer. And November is well, typical November weather!